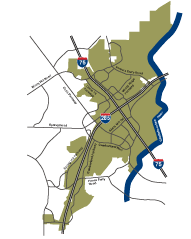 Atlanta – The Georgia State Road and Tollway Authority (SRTA) today announced a $1,500,000 grant to the Cumberland Community Improvement Districts (CID) for phase II of a critical project that includes ramp construction from Akers Mill Road on I-75 for connectivity to the Northwest Corridor Managed Lanes project. This phase also includes strengthening the existing Akers Mill Bridge over I-75 and the ATMS systems. “This vital project will not only improve public safety for drivers and the public, it will help alleviate some of the major congestion on one of the busiest corridors in Georgia and, indeed, the southeast United States. I thank Governor Deal and the State Road and Tollway Authority for their support and leadership on this important infrastructure plan,” said Cumberland CID Executive Director Malaika Rivers. The SRTA approved 423.6 million in grants and loans for 22 transportation infrastructure projects through the Georgia Transportation Infrastructure Bank (GTIB). The GTIB program is a revolving infrastructure investment fund established in 2008 by Georgia legislators and administered by SRTA. The Cumberland CID, 5.4 percent of Georgia’s total economy, has experienced tremendous economic growth and will realize $5 billion in private and public investments by the end of 2018. The Cumberland area, with more than 133,000 employees work, is also forecasted to be at least 50 percent of Cobb County’s total job growth of the next 25 years. It is also home to many major tourist attractions including the Cobb Galleria Centre, Cumberland Mall, the Cobb Energy Performing Arts Centre, Atlanta Braves SunTrust Park, The Battery Atlanta, and numerous hotels. The residential population is also growing with 11,000 more new residents projected by 2018.